This sleek and affordable business laptop comes with a few bells and whistles to get the job done, but suffers from a few irritating flaws. When you're looking for a business laptop, you know exactly what you want. The notebook needs long battery life and the features to get you up-and-running wherever you are and whenever you need it. For these reasons, the Acer TravelMate P645 is a fine choice. A good business notebook also needs to be compact and light, so that you barely notice it in your bag. At the same time, the machine must be able to withstand getting jostled around a bit. And for that, the TravelMate P645 is suitable as well. Finally, this laptop needs to be affordable enough that you can write it off, put it on the company card or buy a whole fleet of them for your team. And this Acer laptop is cheaper than much of the competition, including the HP ZBook 14 and Lenovo ThinkPad X1 Carbon. The bottom line is that a business laptop needs to excel at the right things, and to hell with all the bells and whistles of other rigs. Besides security, that is – and this laptop does include some serious security features. Like its competitors, the TravelMate P645 features a fingerprint reader. This is becoming standard for enterprise laptops, though the TravelMate's Trusted Platform Module 1.2 sensor is located strangely in between its trackpad buttons. It would have made more sense for these buttons to be bigger and put the sensor off to the side, but oh well. Regardless, for a laptop that may both travel the world with you and contain important trade secrets, the user's extra security is invaluable. 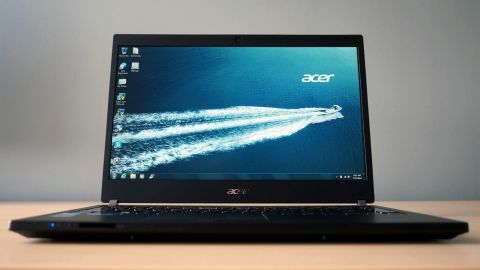 If you want to use the fingerprint reader to log in to Windows, you'll have to go through a rather painful registration process using Acer ProShield, the manufacturer's baked-in security software. It will take some practice to get the app to register your fingerprints at first; you can't move your finger across it too quickly or too slowly. But once the software does, the TravelMate is good at recognizing them again. And you can register multiple fingers – you know, in case one or two get lost. The ProShield software suite also provides a secure hard drive partition that can be password and fingerprint-locked, let you enable and disable specific hardware ports, alter the laptop's component boot order and more. It's a pain to use, as ProShield settings can supersede Windows settings, and it's sometimes tough to know which program is in charge. (For example, when setting or changing your Windows 7 log-in password.) But it's not a bad tool to have on your side once you get it working. The TravelMate also has special tools for IT managers, including Acer Office Manager and Intel vPro Management. Design-wise, the TravelMate is everything you want in a work computer: light, compact, sleek, unassuming, practical, attractive and utilitarian all at once. As thin as it is, the TravelMate also feels reliable, and components ranging from the touchpad and mouse buttons to the screen hinges all feel sturdily in place. There's no flimsiness to this laptop, and it seems like it can really live up to its name. The lid itself is made from light-but-durable carbon fiber, while the palm rest and base is magnesium-aluminum that will feel cool under your palms. This full keyboard is also backlit, though there's only one brightness setting, and it's supposedly spill-resistant, though for obvious reasons I didn't test this. Important functions like brightness, volume and mute are all located conveniently. However, it should be noted that the icons for "brightness up" and "brightness down" were placed on the wrong keys – left and right arrows, respectively, while it should be the other way around. The keys still function as you'd expect, just with the wrong images on them. A more glaring issue is the fact that the Synaptics touchpad's horizontal scrolling never worked, even after several minutes of fiddling with various settings. That's an issue that might take more troubleshooting to overcome. Finally, it's worth noting that the laptop's speakers are located on the bottom, which is obviously less than ideal.